When you're planning a kitchen, of course it's important to get the flow of the space, and the position of appliances and work surfaces just right, and to make sure that everything is in the most convenient location for how you want to use the kitchen. But how does a professional interior designer approach the look of a new kitchen, whether contemporary or traditional? Find out with these expert interior design tips for kitchens. And for any other kitchen related questions you might have, be sure to check out our ultimate guide to how to plan a design a kitchen too. 1. Is your kitchen layout properly space-planned? Is everything where you need it? Consider how and where you use the different items in your kitchen, and place everything conveniently. Breakfast cereals and bowls should be near the breakfast table or kitchen island, for example. Plate storage and the bin should be as near as possible to the dishwasher, which, ideally, should be near the sink. Bread board and bread storage near the toaster; cups near the teapot or boiling water tap. Is the gap between cabinetry runs wide enough? Designing a galley kitchen? Or perhaps installing a kitchen island? Paths through the kitchen should be 1m wide, and through cooking zones, at least 1.25m wide. Have you got the direction of traffic right? All kitchens lead off other rooms and often overlook a garden, so getting the passage between the various spaces right is vital, especially so if you're designing an open plan kitchen, diner and living space or a planning a family kitchen. Ideally, the layout of the kitchen should look natural but you also want to ensure that the cooking zone isn't the room's main thoroughfare. Why? From a safety point of view, you don't want children catching pan handles as they pass; and, from a cook's point of view, you don't want to be constantly moving out of the way of people passing through. And if your kids constantly access the fridge or cupboards for snacks, that might mean considering the location of these two zones carefully, too. Just as you would in your living room, base the choice of your kitchen cabinet colour on how it will make the room feel. This is largely down to the amount of natural daylight the room receives, and where in the room the kitchen sits. So, if you're designing a kitchen extension with the dining and living areas overlooking the garden, and the kitchen units at the darker end of the room, light-coloured cabinetry will reflect light around back into that part of the room, making it feel larger. 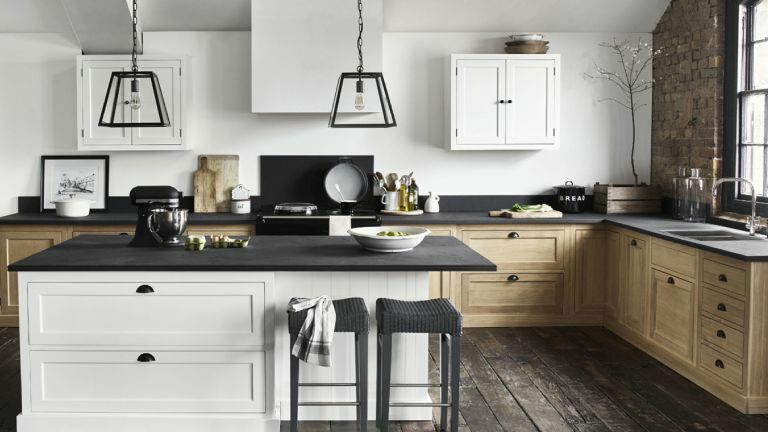 If, on the other hand, your kitchen is sitting within a south-facing, light-filled room, darker units are not only entirely suitable, they might actually make the kitchen feel more homely. Choosing the right colour for kitchen cabinets isn't just about light, though. Picking a grainy wood finish for your units will introduce texture and interest into an otherwise featureless room – perhaps a contemporary extension that has no period details. Or perhaps you want to introduce a bold colour to your kitchen? Popular when painting cabinetry, bright colours add instant personality to the kitchen; however, this should be done with caution: you have to be sure you will love your kitchen's bright colour scheme now and in the future, and it's not wise to choose a bold colour if you think you might sell within five to 10 years. You could of course always paint your kitchen cabinetry yourself and then revert back when you get tired of it or come to sell your home. Check out our guide to painting kitchen cabinets to find out how. Still love the idea of a bold kitchen colour? Limit it to a painted kitchen island – you'll get maximum impact that you can easily transform. Finally, the colour of your kitchen cabinets should, ideally, reflect the colours used elsewhere in your home. This goes for every room – if it echoes the themes and schemes of all the others, your home will feel more cohesive and will flow better overall. High-gloss, mid-sheen or matt finish for your kitchen cabinetry? This is really down to the style of your home. If it's contemporary, high-gloss units will fit right in, as will mid-sheen and matt finishes. If it's a traditional home or period property, steer clear of high-gloss and stick to mid-sheen or matt finish cabinetry. It's always worth doing your research on both cabinet colours and finishes – ask your kitchen designer the right questions, and see if you can take cabinet door samples home to see how they will look in your room's light, rather than under showroom lighting. Check out our 25 kitchen cabinet ideas, too. 4. Is your kitchen cabinet design right? Consider the kitchen cabinet style you want from a purely aesthetic view. You may love the traditional feel of a Shaker style kitchen, but would the sleek lines of a handleless, ultra-modern kitchen suit your contemporary kitchen extension better? Could a curved kitchen be more sympathetic to your small kitchen's proportions? How do the cabinets' handles and knobs complement other fittings in your home? Choosing the best kitchen worktop types is as important as getting the cabinetry colour and finish right. If you're installing a high gloss, contemporary kitchen, this is the opportunity to introduce warm texture, such as wood; if your room has period detailing, such as a marble fire surround, perhaps marble worktops – or composite lookalikes – will be a good way to tie the scheme together; or perhaps you'd like to mix and match different worktop materials within a run of units and a kitchen island to add interest to the room? If you're designing a stylish kitchen on a budget, you might have scrimped on the cabinetry or be planning to fit your kitchen yourself – either way, good quality, handsome kitchen worktops will lift the room instantly. 6. Is the kitchen detailing up to scratch? Do you have a gap to fill? Rather than fill over it with a blank piece of cabinetry, could it be made into a handy bread board or tray niche? How far from the ceilings are the top of your cabinets? They need to either be far enough that you can get in to clean them (kitchen cabinet tops are sticky dust traps), or designed to be floor-to-ceiling to avoid this and to make the most of storage space. Where will your least good-looking or least-used appliances be stored (this includes the microwave)? Ideally, they'd be fitted into a larder cabinet or stashed away when not in use so as not to gather dust and clutter up worktops. Is everything at the right height? It's all very well stacking fitted ovens, but if you can't easily or safely remove hot dishes from yours because it's too high, then you've made a costly mistake. Similarly, can small children reach what they need safely? A low cupboard with their cups and bowls stored inside will help them be more independent and stop them climbing up on worktops to reach what they need. Is there enough room on either side of the hob or just next to the oven to put down hot dishes? Ideally, you need a good 40cm of worktop space for this. Have you got electrical points exactly where you need them – including on a kitchen island – and are there enough? Ideally you don't want to have to unplug appliances to be able to use others – or to charge a phone, for example. 7. Have you got the right kind of kitchen storage? Good storage for small kitchens can make or break your room, so pay particular attention to getting these details right. And if you need any more tips of getting the best storage for small kitchens, check out our gallery for ideas. Planning kitchen lighting needs be done early on – at extension design stage or when you're considering your kitchen's layout. Task lighting is a given, but don't forget to work in ambient lighting, dimmable options and good-looking pendants: your kitchen shouldn't just be about how it functions; how it looks while you're eating or socialising in it is important, too. 9. Is your kitchen fit for socialising? If you've worked a kitchen island into your design, have you come up with kitchen island seating ideas? Is there enough space for yours or would a breakfast bar do the trick just as well? Are the bar stools or dining chairs you've picked comfortable enough to encourage people to linger? You'd be amazed how much these small details will increase the amount of time your family spends together – and they're a handy addition when friends come over, too. If you need more advice on adding a kitchen island, have a read through these clever kitchen island design ideas. From choosing kitchen wall paint colours to creating a gallery wall or picking pretty kitchen wallpaper designs, giving your kitchen's interior design personality is all in the detailing. Choosing the best kitchen window dressings, sourcing the best kitchen flooring or simply displaying family photos effectively are all part of the process of giving your kitchen personality. Just as you'd add those personal touches to a living room, putting your own stamp on a kitchen will take it from showroom piece to heart of the home.